Precision Auto stays abreast of all industry innovations to make sure its customers are always receiving the best services. Mazda engineers and manufacturers are known for their innovation and forward-thinking designs. When you drove your Mazda home you should have made a pitstop at our facility to give your vehicle a taste of our superior services. As engineers are making Mazdas more advanced for next level driving experiences, service technicians need to keep up. Our experts are always ahead of the technology curve, and we always increase our knowledge base. That’s why responsible Mazda drivers come to us. We’re fellow Mazda enthusiasts and have dedicated a large portion of our expertise to your Mazda. You’ve invested in a high-powered vehicle and deserve to enjoy it in peak condition. We know the path to take to get to excellent Mazda performance. Our goal is to keep you on the road, but that’s not all! Mazda engineers have put a lot of time and energy into making Mazdas one with their drivers. This focus on superior driving experiences, comfort, and driveability is what our team is concentrating on. Take a trip to Precision Auto as soon as possible to see how we can protect your Mazda engine and mechanical systems. Preventative maintenance keeps you ahead of all repair problems. If you pay attention to the warning signs then bring them to our attention, you’ll have nothing to worry about. Don’t wait until the repair or the breakdown happens. Act fast and be proactive with your Mazda’s services and we can be quick too. Your oil changes will be on time and thorough. We design an oil change, tune-up, lube service, and engine diagnostic to help us identify any potential problems. The Precision Auto team of technicians can put, and keep, your Mazda in its original condition. Drive away feeling like your car is brand new after every visit to our shop. 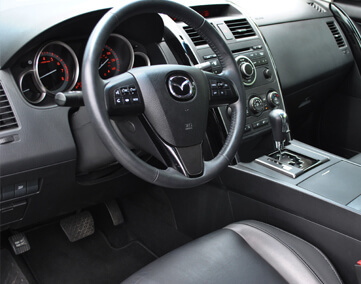 This expert level of Mazda service and attention makes us the preferred alternative for Mazda maintenance and repairs. You can be sure to get speedy and accurate services at Precision Auto in Germantown, MD. Bring us your engine repairs, transmission repairs, brake repairs, exhaust system repairs, air conditioning repairs, check engine light repairs, and any other service need. Schedule Your Mazda Service Today! Our Mazda service experts are ready to make you and your vehicle a perfect match. With stronger engine performance and enhanced driveability, you’ll never be on the side of the road. Give us a call today at 301-917-2682 to schedule your Mazda repair or maintenance service. Next time you’re in the area, feel free to stop by to meet the Mazda service experts. Save yourself some time by scheduling an appointment right now using our convenient online scheduling system.